You know that little planet in Solar System? The one with lots of water in it? Yeah, that's the one! Google is in development of the next Android version - Key Lime Pie. Since Jelly Bean came out as a minor update from 4.0 to 4.1, we are curious to see what a major update will bring to our green little Android. And according to current rumors, Key Lime Pie will be a major update being the 5.0 version. According to the picture made by Google, (above) the next version of Android will indeed be Key Lime Pie. The next Android version, Key Lime Pie, will be 5.0. It will be announced on Google I/O in May 15 to 17, could be delayed by 2-4 months. The first phone running Key Lime Pie might be Motorola X Phone. The Nexus device of Key Lime Pie will be manufactured by LG. Key Lime Pie might get 3.8 kernel which aims to lower the RAM consumption making the phone more smooth and multitask better. Samsung could put a new feature to the Galaxy S 4 - Samsung Orb. It is a Photo Sphere-like feature that allows making 3D pictures where you can look at the pictures in 360 view. Another rumor suggests that Key Lime Pie will support performance profiles. Instead of choosing between sound and brightness options, you choose the processing power. This way you can easily switch between battery saving mode, high performance mode, balanced etc. Google may create a new messaging service that will merge Google Talk, Google Messenger, Google Voice and Gmail into one simple-to-use app. This might be useful as some users complain that these services are not integrated together and it's difficult to check all these inboxes. Reports on this new messaging service has surfaced on several sites. It will most likely allow video-chatting/ The rumored name for this service is Google Babble. New Google gaming service with Real-Time Multiplayer, Turn-based Multiplayer, In-Game chatting, Lobby rooms, Invitations, Achievements and Leaderboards. Keep in mind that these are only rumors. Some of these rumors are more likely to be real, some seem unlikely but we will know everything once Google announces Key Lime Pie supposedly on Google I/O event on May 15 to 17. Reports say that the 5.0 version of Android will come to five Samsung devices - various versions of Galaxy S 4, Galaxy S III, Galaxy Note II, Galaxy Note 10.1 and Galaxy Note 8.0. Note that Galaxy Nexus and Nexus 10 are not included because they are owned by Google and not Samsung but they are also likely to get to taste some of Key Lime Pie. No word about other manufacturer devices. If you've heard any new rumors concerning Key Lime Pie, feel free to post them here. Also, tell me what you would like to see in the upcoming version of Android! Last edited by Tears_for_Fears; 04-23-2013 at 06:42 AM. wicked, UltraDroid, Astrix and 1 others like this. Warning! All outlaws will be shot! Survivors will be shot again! The rest of you, have a nice day. It's been a while since I've added any new rumors concerning Key Lime Pie and I've found some more, so I decided to update this post from time to time as new info comes out about Key Lime Pie. UltraDroid and CJM like this. For those of you who are curious, mobile backened development firm Kinvey has made an info graphic of Android evolution ever since the beginning of Android 1.0 prototype. UltraDroid, tuxedo, CJM and 1 others like this. Thanks for the info mate... Btw Will old devices get official update of lime pie.. Imo atleast they should provide us something from it. Surely 5.0 will be hardware dependent but mini updates would keep us going. Fed up of upgrading device time to time. I know the demand is noobish but mid enders should also get some perks. Mid-rangers will most likely not receive the Key Lime Pie update but some of them may receive a Value Pack, just like it was with Android 4.0. It's not up to Google, it's up to the manufacturers. Yes, it's a shame that mid-range smartphones are often left out from the latest. However, there is an option of custom ROMs. If latest official updates are important, I suggest getting a Nexus device. Or the upcoming Motorola X Phone, supposedly to be released in the second half of 2013.
bkdodger, herecomesmaggi and UltraDroid like this. Another rumor whispers about a new Google service dedicated for games, similar to Gameloft LIVE! and XBOX Live. This rumor seems pretty solid because a teardown of MyGlass (Google Glass companion app) shows a new Google Play Services component called "games". This component was shipped with Google Glass but it is doubtful that it has anything to do with Google Glass because as Android Police puts it, you can see that every component in all the services are used properly but Google Glass doesn't need some of what's in it. It's possible that Google just pressed "ship everything" in MyGlass app. This feature allows several players to play the same match simultaneously in games like FPS and racing. This feature is for multiplayer games that are played turn by turn, like strategic games, card games and board games. These files suggest that we can chat with other players while playing RT Multiplayer games. Apparently, there will be rooms before making matches in games. Probably be able to chat before playing and choose rules of matches. This hints that players will be able to invite other players and/or added friends into matches. Here we can see that this gaming service will include achievement system like badges and awards. And of course, without a doubt, there will be leaderboards to compare your results with other players. There is no info about the design which either means that developers of the games will have to make the design themselves or that this service is still inside the workshop. No info of the name either. Whether this gaming service was meant for Google Glass or not, we are sure that it's real and coming soon to Android. Seeing it as it's close to complete, we are guessing it will come with Android 5.0 Key Lime Pie, or if it won't make it to the launch, it will come as a future update. Is anyone excited about this new feature? I'll put this on the OP. Last edited by Tears_for_Fears; 04-21-2013 at 03:46 PM. 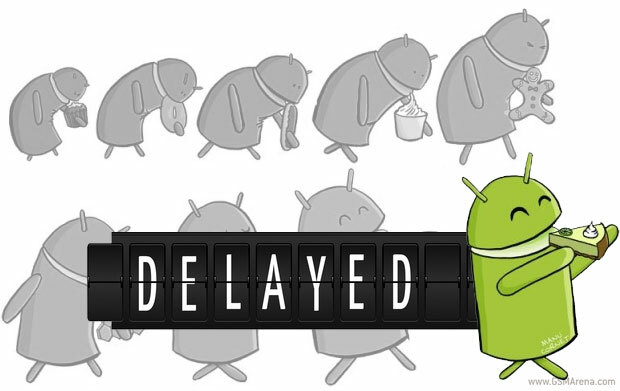 Android Key Lime Pie delayed? According to a new rumor, Google might delay the 5.0 update of Android by as much as 2-4 months and it won't make it to Google I/O. The reason for this is that Google wants to give manufacturers more time to update as many current devices to the later versions as they can. Android Ice Cream Sandwich and Jelly Bean are finally taking up some decent percentage in all Android devices. This data was collected by Google during a 14-day period ending on April 2, 2013. As you can see, Android 4 has 54.3% of distribution in all Android devices. This delaying, although sounds disappointing, may actually be a good thing. Plus, this even strengthens the possibility that Google will indeed put in the 3.8 kernel in Key Lime Pie. But as always, take this with the usual pinch of salt because it was not officially confirmed by Google and may turn out to be untrue. What do you guys think, should Google delay Key Lime Pie or launch it on time? That's the normal procedure - release a new Nexus, with the latest Android - then shortly after, send the latest android to existing Nexus owners. That's one of the perks of Nexus ownership.